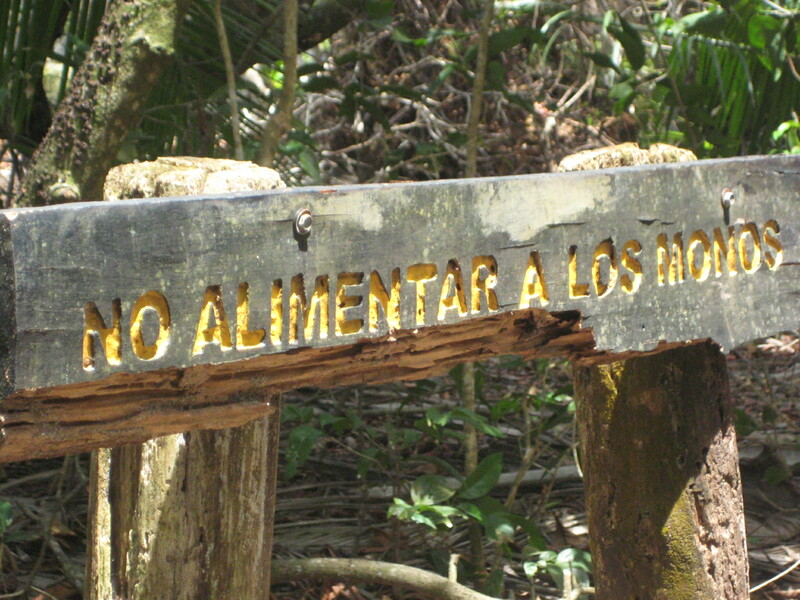 A follower/friend/fellow intrepid herbivore recently posted a question to our Facebook page asking for tips about travelling and eating in Central America. Because I had such a great time when I visited Costa Rica in 2010, there is simply not room for me to respond through a Facebook status alone! While I only spent one week in Costa Rica and thus cannot speak for the rest of the region, I can say that this was one of the easiest and most enjoyable countries to eat vegan food I have visited yet–and that’s saying a lot! The national dish of Costa Rica is called a “casado,” and is available in just about any restaurant or food stall. It is essentially a plate of rice and beans accompanied by…anything else. 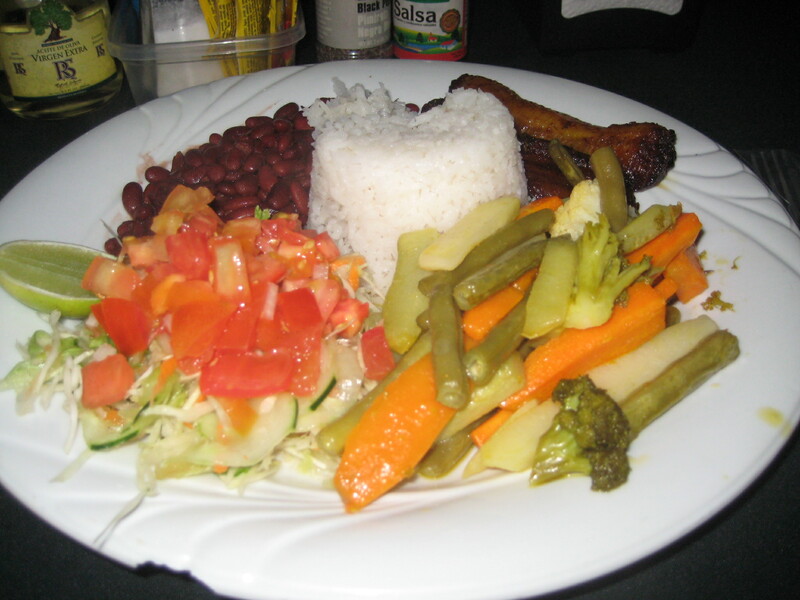 It usually features a side of fried plantain and then whatever the featured item might be. If you simply ask for a “casado vegetariano,” each cook will surprise you with their own interpretation! Be sure to specify “sin huevos” and “sin queso” to avoid being served eggs and cheese (which could well happen if you don’t say something). 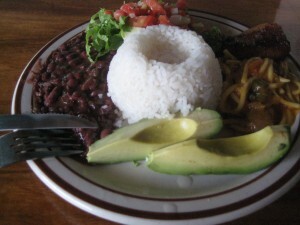 rice and beans + avocado, salad and crazy noodles! Besides thoroughly enjoying hikes in Manuel Antonio National Park, a visit by bus to Domenical with an unforgettable walk along the most epically gorgeous coastline I’ve ever seen in my life (also a nearly near encounter with crocodiles), I had the opportunity to visit Villa Vanilla, a sustainable spice plantation in the forest. 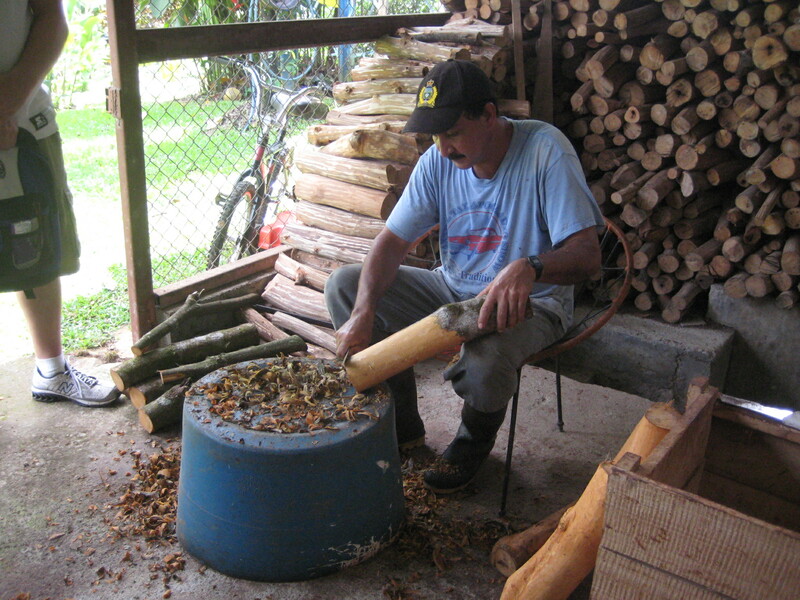 A cinnamon farmer shaving the bark of a freshly-harvested tree of deliciousness. They grow cacao, vanilla, peppercorns, turmeric, ginger and cinnamon! I sometimes sit and muse about food (it’s true), and occasionally I will try to catalogue my memories and recall/identify the most delicious things I have ever experienced. Hands down (and I swear to you I have actually given this a lot of thought over the past three years, it is NOT a hyperbolic rambling of someone trying to prove a point), the most delicious thing I have ever eaten in my entire life of eating was this freshly stripped bark of a just-harvested cinnamon tree. Yes, they handed us a piece of wood and instructed us to chew on it, and it definitely felt like you were chewing on the bark of a tree, but it was sweet, spicy and subtly juicy. It tasted nothing like the powdered cinnamon you buy in cans (and in fact, I learned a lot about the difference between “cinnamon” and “cassia”–two related but entirely different plants. Most “cinnamon” marketed in the United States is actually cassia–if you’re curious, try tracking down some “true cinnamon” or “ceylon cinnamon,” and you’ll be tasting the tree that I had here). My guide at Villa Vanilla was awesome and it was an incredibly informative tour about cultivated rainforest farming. They served us samples of all of their crops (some vehicles of which were not vegan, such as cacao cookies made with butter and cinnamon ice cream made with dairy), but they made an exquisite cinnamon tea and of course you could taste all of the spices straight off the plant, which was cool. 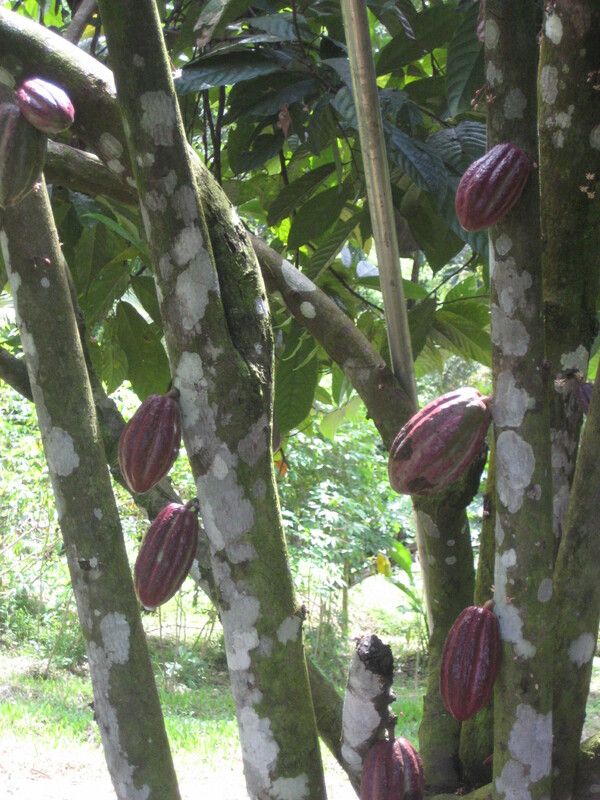 This was my first time eating a straight-up cocoa bean right out of a pod and that was awesome. 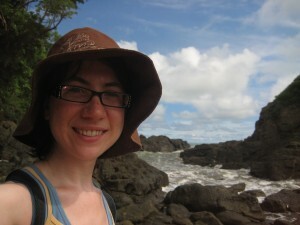 Costa Rica is FOR SURE on my list of places to return to at the first available heartbeat! 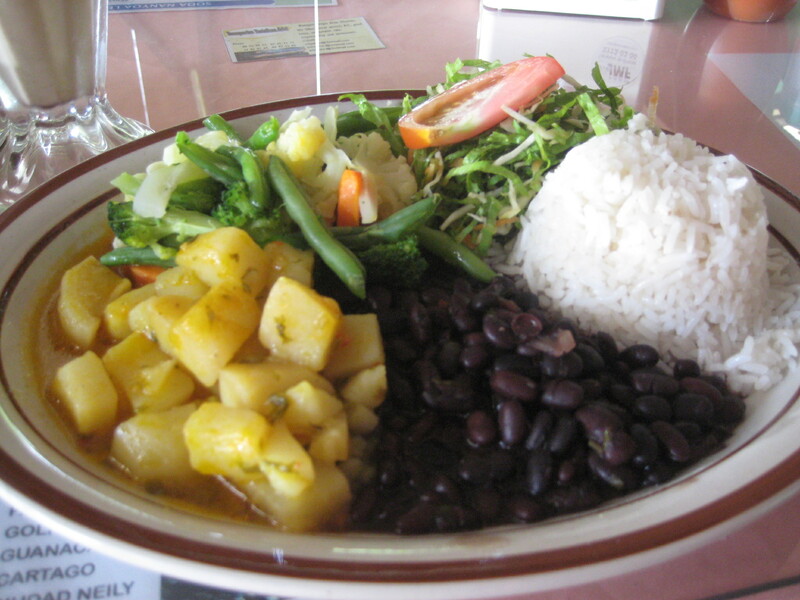 I am also keen to explore other parts of Central America, and I know that I will eat extremely well with the abundance of rice and beans as well as glorious, glorious tropical fruit! I don’t have pictures of it all, but my bus ride took a detour through a banana grove and past vast orchards of papaya trees. 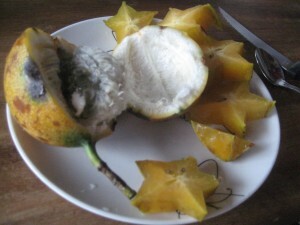 I ate so much guava, star fruit,pineapple, plantain…oh! The fried plantain! So good. You are going to love it there. 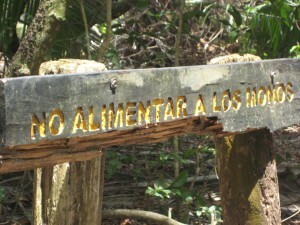 Just don’t feed the monkeys! seriously, they will eat all of your food. This entry was posted on February 22, 2013 by sadie in travel stories, Uncategorized and tagged Central America, Costa Rica.